Thanks to Les Blatt at Classic Mysteries for the heads up on this little gem. 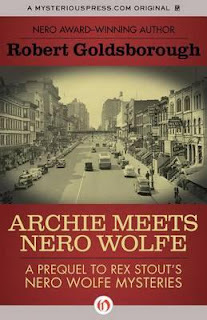 Upon reading Les's review, I had no choice but to order ARCHIE MEETS NERO WOLFE. It arrived a couple of days later and I immediately dropped everything and read it straight through. While I'm not overly fond of Robert Goldsborough's Archie Goodwin and Nero Wolfe re-incarnation (he just doesn't have the writing verve of Rex Stout, or the brilliance - but then, who does? ), I did enjoy reading this prequel. I'd always wondered how Archie and Wolfe came to their lifelong partnership and now I know. The thing I like best is that Goldsborough used clues dropped by Stout in his stories over the years to augment his tale of a fresh faced nineteen year old college drop-out arriving in NYC direct from Ohio. Archie is lucky enough (it's the Depression era) to get a job as a night-watchman but does too good a job. So good, in fact, that he's fired. Next he talks himself into a job with private detective Del Bascomb (mentioned by Wolfe over the years as a reputable firm) who is still - at this point - a small time operation. 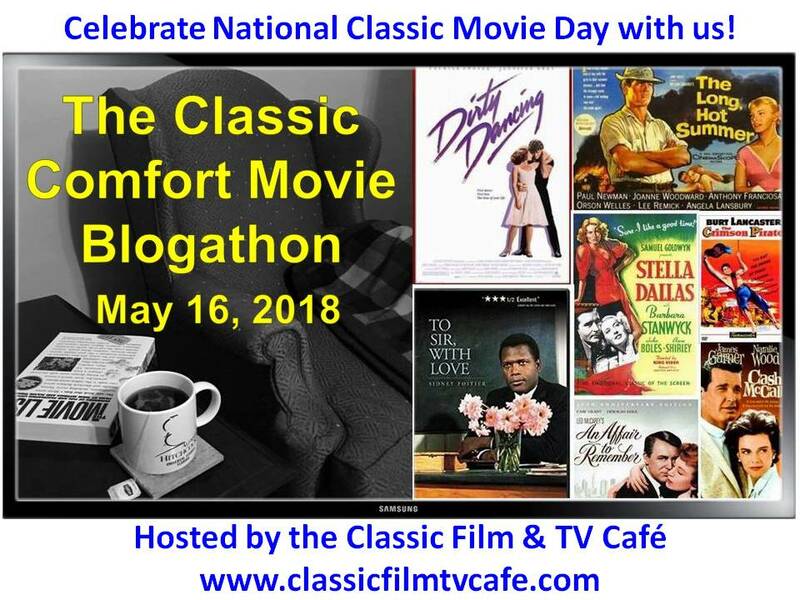 Bascomb brings his capable protege, Archie, along with him and there in the brownstone, with Fritz and Theodore already in place, we have The First Meeting. It's a good enough case with a couple of murderous villains (though no child is harmed in the making of this story) who keep our heroes plugging along in their wake, up and down the streets of the Bronx that once was. 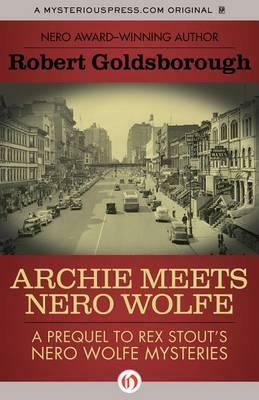 ARCHIE MEETS NERO WOLFE, a nice trade paperback published by Mysterious Press, is a must addition to any Nero Wolfe library and a great gift for any Nero Wolfe maven. Yvette, like you, I have had trouble with most of Goldborough's Wolfe books - something always jars me, so that I say, "Oh no, Wolfe (or Archie) would never say/do that." 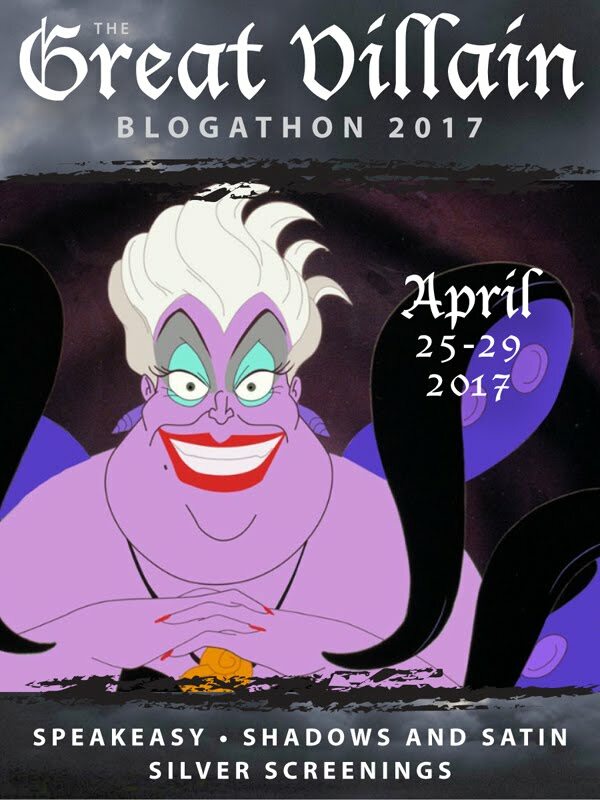 I think it's less of a problem here because it's a prequel - we expect the characters to be a little brasher, a little less smooth. The occasional rough edge doesn't jar as badly here. The result: a book that's a lot of fun and really does add something to the Wolfe/Goodwin saga, IMHO. Sorry you feel that way, Nan. I would normally not want to read many of the resurrections that are out there. But this one I didn't mind. You hit the nail on the head about Gainsborough's lack of "verve", but you really have me curious about this prequel. Thanks for this idea. It's a good one, sounds like I should read it. Just took out two sets of three short stories each starring the Wolf pack. No children were harmed, but maybe an orchid or two were grazed and surely a fish was fileted and a lamb shanked and a beef roasted. I needed a fun break after a sad book, and Wolfe and Co. perked me up. Never fails. I have this book ready to read in 2013. So glad to hear more positive comments about it. Can't beat the Rex Stout books, but then, I have reread those so many times. This will be a new visit to Archie and Nero Wolfe. Kathy, it's not Rex Stout, but it's still interesting to read about Archie when he was a young and callow youth. :) Not so callow really, he seems to have been a very adult 19. Tracy, let us know how you like this. IF you like it. I thought it was a fun addition to my Nero Wolfe library. Idiotically, I stayed up all night watched Season 2 of Wolfman and Goodwin together, but must defend myself with temporary state of insanity due to too much watching of the Conn. tragedy. I needed humor, and they provided it along with Russell Quant in Anthony Bidulka's hilarious Saskatchewan mysteries. I put the first Zeck book on library hold. I'm surprised they still have paper books, as everything is turning into audio and ebooks (bah, humbug) or is being taken out of circulation and put at Schwarzmann -- who has time to do there for hours? I'm lucky enough to own the Triple Zeck book, found it online real cheap a while back. I read this recently, and I found it to be even more lifeless and devoid of wit that Goldborough's other Wolfe books. 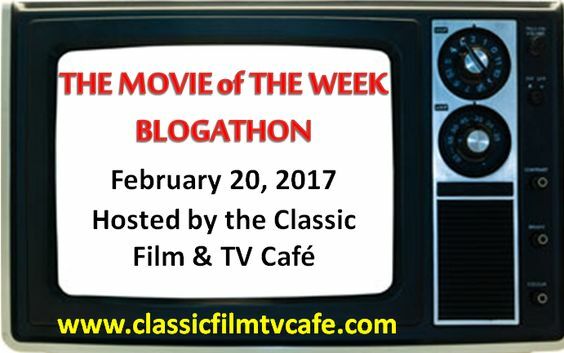 In some of the others, sometimes, I could suspend my disbelief, but in this one the narrator is unquestionably not Archie, but an impostor. The large cast of characters is mistreated; the ones we know (Wolfe, Panzer, Durkin, Cather, etc.) are shadows or caricatures of themselves. Orrie Cather in particular is made out to be an offensive jerk. The other characters are sometimes almost indistinguishable from one another. I was finding myself thinking after I finished that it is a disservice to Rex Stout's memory to put his name on the cover and wondering why his estate allowed it to be published. Money, i suppose. I deeply apologize to anyone who thought this book was any good, and doesn't like what I have said. Our tastes must differ greatly. Wastrel: Oh, I know it wasn't the best. But at least it tried to give us an idea of what came before. Although you make good points. I never really believed it was Archie's voice and as for the rest of the gang - well, not quite. PS No apologies necessary. We welcome varying opinions on this blog.